Nestled within The Bahamas island chain, The Exumas are a breathtaking cluster of uninhabited islands, hidden anchorages and tiny cays dotted along a 130-mile ocean stretch. Here you'll explore the most glorious undersea world, dine on the freshest seafood, and dance under a blanket of brilliant stars after the sun sets. Come discover one of the world's best-kept secrets. When booking your Pura Vida charter, your charter broker will work with you to create a personalized itinerary tailored completely to your preferences. As its name would suggest, Highbourne Cay offers one of the highest elevations in the Exumas. Stretching for three miles, Highborne Cay is known for its beautiful beaches and the rare Bahamian stromatolite formations, which are remnants of the Earth's oldest reefs. Divers and snorkelers shouldn't miss a visit to the 16th century shipwreck off the island's northwest shore, which is reputed to be one of the oldest wrecks in the Americas. Hike The Spring to capture moments of expansive sea views. Once a the hideout for famed drug smuggler Carlos Lehder, Norman's Cay is energized with intrigue. 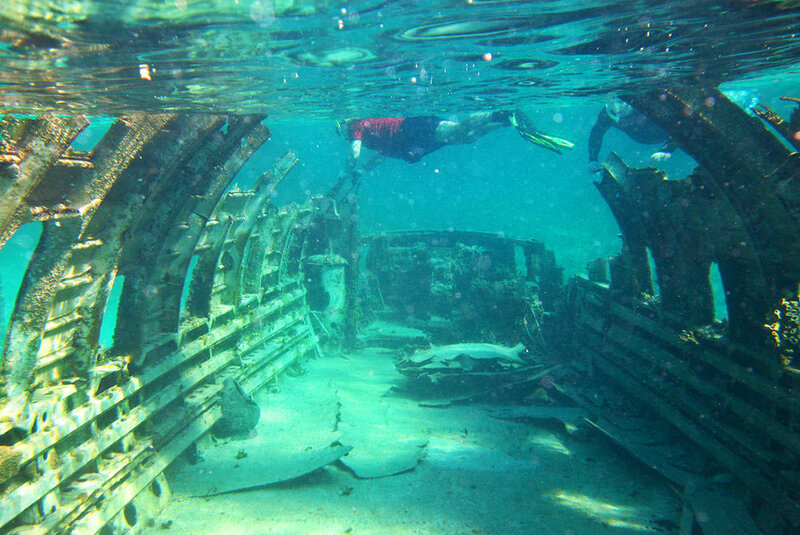 Just off the coast, the partially submerged remains of a Curtiss C-46 Commando drug-smuggling plane peek out of the water and invite snorkelers to explore its cockpit. Norman's Cay offers breathtaking bays, sugar-sand beaches and quiet lagoons that feel more meditative retreat than its colorful history would suggest. This exquisite island is a picture of natural splendor. Known for its channels of mangroves housing myriad aquatic and wildlife, Shroud Cay is also home to the endangered white-tailed tropicbirds, which can be spotted nesting in limestone rocks. Here you can spend the afternoon kayaking through the mangroves at high tide, hiking to the highest vantage point for panoramic views or diving the Wax Cut Drift Dive, which boasts stunning coral formations. Snorkeling is unbeatable in the protected area of Warderick Wells, which is part of the 176-square-mile Exuma Cays Land & Sea Park. Here you'll swim among giant sea turtles, colorful fish and magnificent coral, and then explore the old pirates' hideaways at Hog's Cay and Pirate's Lair or beachcomb on Beryl's Beach sandbar. On shore, get up close to the 53-foot skeleton of a sperm whale, hike the famous Boo Boo Hill or visit the ruins of an 18th-century plantation. Also known as Little Bells Cay, Cambridge Cay is one of the most beautiful anchorages in the Exumas. Snorkel through an undersea plane wreck teaming with sea life or dive the wondrous “Sea Aquarium” miniature wall dive. Take the kayak or paddleboards out for some exploration, hike the scenic trails, visit the natural blow holes or tender to the nearby private islands and cays that are home to celebrities and swimming pigs. Or, simply spend your days relaxing on a sand bar, enjoying Instagram-worthy views, sunshine and clear Bahamian waters. Staniel Cay is home to the infamous Thunderball Grotto, a magnificent sparkling underwater cave easily accessible to snorkelers. The marine life is accustomed to visitors here and you may be greeted by schools of curious fish or the resident barracuda who begs for scraps from visiting boats. Visit the Staniel Cay Yacht Club or head to Fowl Cay to dine at the Fowl Cay Hill House Restaurant.